Kathryn Riffenburg decided on a closed casket for her baby’s funeral. She didn’t want her family to see what whooping cough, her son’s first illness, had done to 9-week-old Brady Alcaide. The nearly forgotten disease, which has in recent years afflicted thousands of Americans, left Brady’s tiny body swollen and unrecognizable. So his mother dressed him in a white baptismal suit and hat and tucked him into a tiny white casket. Brady’s burial came just four weeks after his first laugh — inspired by her version of I’m a Little Teapot — and two weeks after his family learned that he had contracted a vaccine-preventable illness. The mother, who was inoculated years before giving birth to Brady, later learned that she could have gotten a booster shot during her pregnancy that likely would have saved Brady’s life. Although Riffenburg didn’t know to get revaccinated, people actively choosing not to are helping diseases once largely relegated to the pages of history books — including measles — make a comeback in cities across the nation, according to the Centers for Disease Control and Prevention. Recent measles outbreaks in New York, California and Texas are examples of what could happen on a larger scale if vaccination rates dropped, says Anne Schuchat, the CDC’s director of immunizations and respiratory diseases. Officials declared measles, which causes itchy rashes and fevers, eradicated in the United States in 2000. Yet this year, the disease is on track to infect three times as many people as in 2009. That’s because in most cases people who have not been vaccinated are getting infected by others traveling into the United States. Then, Schuchat says, the infected spread it in their communities. Vaccination rates against most diseases are about 90%. Fewer than 1% of Americans forgo all vaccinations, Schuchat says. Even so, in some states the anti-vaccine movement, aided by religious and philosophical state exemptions, is growing, says Paul Offit, chief of infectious diseases at Children’s Hospital of Philadelphia. He points to states like Idaho, Illinois, Michigan, Oregon and Vermont — where more than 4.5% of kindergartners last year were unvaccinated for non-medical reasons — as examples of potential hot spots. Such states’ rates are four times the national average and illustrate a trend among select groups. The anti-vaccination movement has picked up steam in the past decade with support from celebrities such as actress Jenny McCarthy, actor Aidan Quinn and reality TV star Kristin Cavallari, who last month said not vaccinating was “the best decision” for her children. Many continue to believe the debunked idea that vaccines cause autism, while others don’t trust the federal government or the pharmaceutical companies responsible for these vaccines. Riffenburg hopes her family’s experience will serve as a wake-up call. At first, Brady seemed to have a simple cold. As his symptoms worsened, Riffenburg and her fiancé, Jonathan Alcaide, took him to the hospital, where doctors suspected he had whooping cough. “I hope Brady has saved babies and protected them because we have spread his story,” RIffenburg says. “It doesn’t have to be on an airplane or at an airport. It could be at a grocery store or the concert you went to,” Schuchat says. Last year, California had the largest number of unprotected kindergartners not vaccinated for their parents’ philosophical reasons: 14,921. This year, 49 cases of measles had been reported by March. The state had four cases by that time last year. 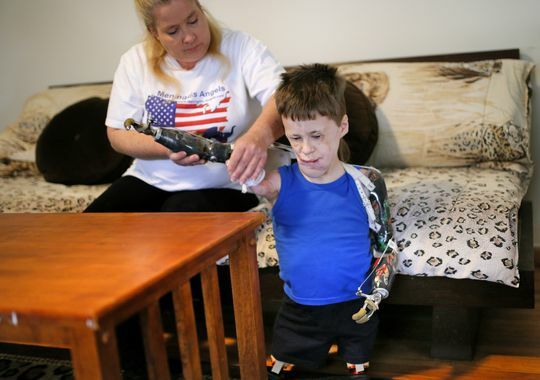 Jeremiah Mitchell, 10, plays Xbox with no hands, writes with a pencil strapped to what remains of his arms and prefers eating pizza because it’s one of the few foods he can hold. Jeremiah wasn’t vaccinated against meningitis because at his age his school didn’t require it, Mitchell says. CDC suggests all 11- or 12-year-olds get the vaccine and receive a booster shot at 16. And though his family did everything according to medical recommendations, Jeremiah was exposed because someone brought the disease into their community. From the medical side of the equation, some physicians have resorted to their own defenses to protect their patients from those who won’t vaccinate. Doctors at Olde Towne Pediatrics in Manassas, Va., won’t take new patients if the parents don’t plan to vaccinate their children. It’s not clear how many other physicians do the same, as experts say no comprehensive studies of the practice have been done. In Colorado, where 4% of kindergartners last year didn’t have their shots for non-medical reasons, a proposed bill sponsored by State Rep. Dan Pabon, a Democrat from Denver, would require parents to get a doctor’s note or watch a video about risks before opting out of vaccines. In 2006, all three of Pope’s children — now 9, 11 and 15 — contracted whooping cough, the same disease that killed Brady. Seven years earlier, Pope had decided against vaccinating any of her children. After seven weeks of coughing, and with treatment by a holistic doctor and natural supplements, all three recovered without complications, she says. Pope and Ellison say it is unfair to pressure parents into using vaccines that aren’t 100% effective. However, doctors note that all drugs — even aspirin — have risks, and none is 100% effective. Even so, parents like Ellison, 39, don’t buy it, and he points out that he comes to the issue with some expertise: He has a master’s degree in organic chemistry and used to work in the pharmaceutical industry designing medicines. His children — 6 months old, 8 and 12 — were all born at home. Aside from one visit to an emergency room for a bruised finger, none of them has ever been to a doctor, and they’re all healthy, he says, except for the occasional sore throat or common cold. “The doctors all have the same script for vaccines,” says Ellison, who runs The People’s Chemist, a website about health. He is working to build and support his children’s natural immune system using three healthy meals a day, exercise and sunshine. He says if his kids get sick he would rather rely on emergency care than vaccines. “It’s much more soothing to trust emergency medicine than a vaccine, which for me is like playing Russian roulette,” he says. Purkiss’ 7-month-old daughter, Olivia, got measles while in a San Diego hospital emergency room last month. Olivia had visited the ER while her dad was having an ingrown toenail removed. Two weeks later, Olivia was back in the emergency room with measles. Doctors spent 12 hours testing and observing her. She later recovered. Posted in Uncategorized and tagged USA TODAY on April 8, 2014 by Yamiche Alcindor.